Leading Ayrshire businessman Alan McLeish has been named one of the UK’s top entrepreneurs in an evening of major success for Scottish businesses in London. Mr McLeish, Managing Director of the QTS Group, was last night (Monday 7 October) named the Ernst & Young Entrepreneur of the Year in the ‘Business and Consumer Services category of the prestigious Ernst & Young Entrepreneur of the Year Awards where four of the ten categories were claimed by businessmen operating north of the Border. Sponsored in the UK by Credit Suisse, Ernst & Young’s Entrepreneur of the Year programme celebrates the achievements of those who build and lead successful, growing and dynamic businesses across the country. It is the world’s most prestigious business awards scheme for entrepreneurs, with programmes in 135 cities in 50 countries, and has been running in the UK for 15 years. Mr McLeish’s award recognised the significant growth in QTS, as well as the company’s ambitious growth plans in Scotland, the rest of the UK and globally. Alan established his business in 1991 with a £300 loan, and QTS is likely to record turnover figures in excess of £70 million for the current financial year in the competitive rail and utilities sectors. Award judges praised Mr McLeish’s “amazing personal business story”, and added that he had “pulled himself up by the boot straps” to build one of the UK’s leading specialist businesses. Mr McLeish said he was absolutely thrilled to pick up the award. 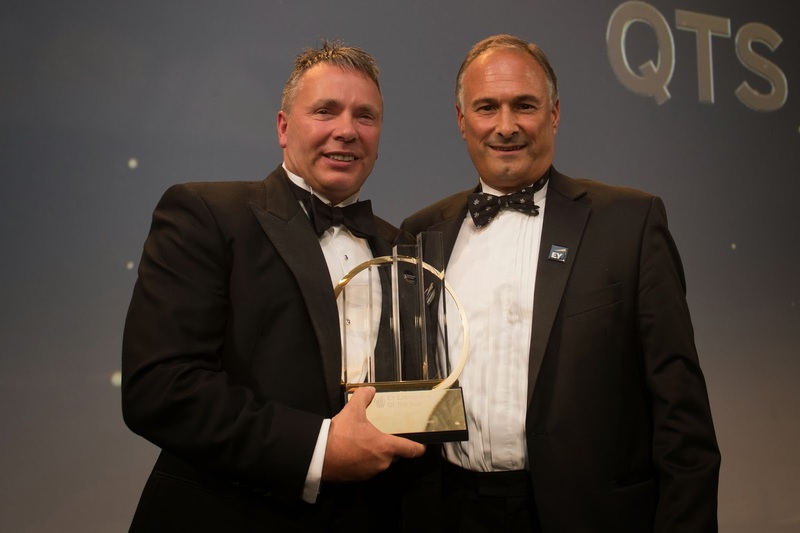 “The past few years have seen major progress and development for QTS across our business in the UK and worldwide and I am thrilled to see that recognised with such a prestigious award,” he added. “To pick up this award in such prestigious company is the stuff of dreams and obviously a major personal highlight. Hopefully, it also in some way repays the faith my mother had in me when she loaned me that £300 to set the business just over 20 years ago. “The whole QTS team put their heart and soul into the business and the huge investments in time, commitment and money we are making here in Scotland will help us grow right across the world. The QTS Group company, which employs 140 staff, is earning a reputation as one of the most dynamic and innovative companies in Scotland with a commitment to providing real opportunities for apprentices and other staff through industry-leading training. The company is best known for the innovations that have made it a leading “one stop shop” service to the rail industry, with specialist road/rail machinery to meet all the challenges in the infrastructure, building stations, rail platforms and footbridges elements of the business. Other Scots winners at the event hosted by the BBC’s Jeremy Vine, included Simon Howie, CEO of the Simon Howie Group, David Lamont, CEO of Aberdeen-based Proserv and Carl Hodson and Duncan Skinner of Glencraft. Their success marked Scotland’s most successful night at the awards ceremony. James Lambert, chairman of R&R Ice Cream, whose brands include Fab, Skinny Cow and Kelly’s of Cornwall, was named the EY UK Entrepreneur of the Year at the gala event which was held at London’s Park Lane Hilton Hotel. QTS is committed to supporting local organisations such as schools and charities, and are the major sponsors of Kilmarnock Football Club. QTS’s fleet of distinctive orange, white and black vehicles have become a well-known feature on UK roads as they work on some of the most complex railway infrastructure projects around Britain.